Childhood: Geshe Gelek was born 1967 into a family living from farming and keeping yaks in the Khyungpo area of Kham, Tibet. Already as a child and as a teenager he was instructed in Bön by Lama Bön-Nying Rang-Drol (a disciple of a disciple of Shardza Rinpoche). Early monastic education: After a visit of Lopon Tenzin Namdak Rinpoche to his village in 1986, Geshe Gelek at the age of 19 became a monk and entered Thongdrol Ritröd monastery. He later stayed in Tsedrug Gompa for a year and studied philosophy with the renowned scholar Lopon Drangsong Yungdrung in Lungkar Gompa for two years. After a second meeting with Yongdzin Tenzin Namdak Rinpoche, who visited Tibet again in 1992, Geshe Gelek decided to pursue a higher education and study for geshe degree. For this purpose he had to leave Tibet. Geshe studies: Once in exile, he went to Triten Norbutse in Kathmandu, which, however, did not offer a shedra (geshe curriculum) at the time. So he went on to Dolanji in India and studied at Menri monastery under Menri Trizin Nymai Lungtok Rinpoche. When a year later, in 1993, shedra was established in Triten Norbutse, he returned there, studied under Yongdzin Tenzin Namdak Rinpoche, and in 2001 obtained a geshe degree. Tummo experiment in Normany: Also in 2001, a wealthy sponsor offered to buy a building for establishing a Bön center in Europe, on condition that Bonpos demonstrate measurable effects of their meditation techniques. Geshe Gelek Jinpa together with Lama Sangye Monlam and a third monk from Triten Norbutse practiced tummo in a laboratory setting observed by Harvard professor Benson. The outcome of the experiment was decisive and Triten Norbutse conregation received the chateau that has since become Shenten Dargye Ling. Teaching: Since obtaining his geshe degree, Geshe Gelek has been teaching in Triten Norbutse and, increasingly, in Europe. He is teaching Dzogchen, in particular from the Zhang Zhung Nyen Gyud and Gyalwa'i Chagtri, and also Tsa Lung and Tummo, regularly in Italy, Austria, Germany, Hungary and Finland, and has also taught in the Netherlands, Romania, the UK, Spain, and Singapore. 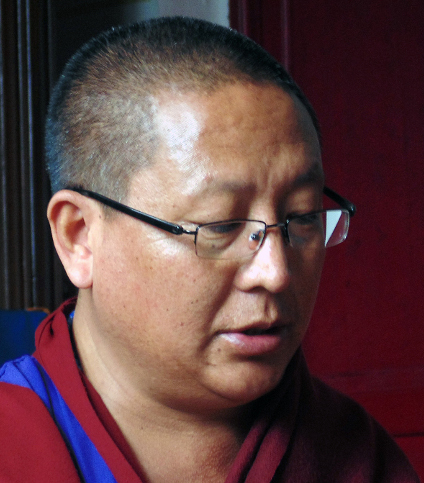 Geshe Gelek frequently teaches courses in Shenten Dargye Ling. In 2013, Geshe Gelek was instated as "Enthroned Lama of Shenten Dargye Ling" by the Khenpo of Shenten's mother monastery Triten Norbutse, Tenpa Yungdrung Rinpoche. In 2014-2017, Geshe Gelek has taught the second 4-year cycle of Shenten Dargye Ling's "Gomdra" (meditation school), focusing on the Dzogchen cycle Zhang Zhung Nyen Gyüd. "Hidden Treasure of Bon -- Secrets of Mustang" (DVD published by Triten Norbutse, available in Shenten Dargye Ling). "Heart Essence of the Khandro", by Yongdzin Tenzin Namdak Rinpoche and Geshe Gelek Jinpa, edited by Carol Ermakova and Dima Ermakov; Heritage publishers, 2012. Dzogchen instructions by the Khandros of the female lineage of Yangtse Longchen, in the original Tibetan, side by side with an english translation, as well as a biogaphy of Choza Bönmo, the last of the lineage - maybe the most female Bön practitioner in historical times. "Bön in Nepal", Heritage publishers, 2013. An account of Geshe Gelek's travels to Bön communities of Nepal and to vestiges of early Bön civilization - ruins of ancient monasteries and practice places of Zhang Zhung Nyen Gyud lineage masters. Translated and edited by Carol Ermakova and Dima Ermakov.